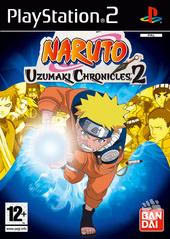 Naruto Uzumaki Chronicles 2 is everything "anime" you would except in a console game and this popular series (both in anime and gaming) has once again arrived on the PlayStation 2 that gives the gamer an entertaining and reachable RPG series with a healthy amount of action and adventure. Unlike the previous title, this sequel features a variety of new combat maneuvers and some inspirational special moves that are over the top and oozing with anime goodness. Multiplayer Co-op and Vs Battles - During the game, a second player is able to join in on the action for a simultaneous two-player adventure! Or, fight head-to-head with a friend and battle it out for the title of Hokage. Story Mode - Play alone or with a friend and traverse a lush, 3-D anime-style world in which Naruto and his friends work together to unravel the mystery of the Shirogane Clan and their nefarious army of "puppet walkers." Hone your skills to become the ultimate warrior and unlock a secret chapter of the story. Mission Mode - Take on a series of challenging side missions. Survival Mode - Test your skills to become the ultimate warrior and unlock a secret mission. 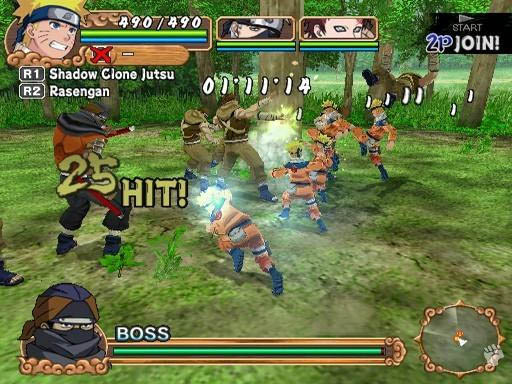 Multiple Playable Characters - Choose your favorite ninja, including Naruto, Shikamaru, Rock Lee, Kakashi, Guy, Sasuke, or Choji, to complete story-driven missions and intense challenges. Character Customization - Prove yourself in battle and earn money to create the ultimate warrior using Chips and Plates that can customize your character's speed, strength, stamina and even special moves. Lethal Attacks and Weapons - Harness the power of Rasengan, Lightning Blade, Sand Coffin, and other moves, straight from the series! In its essence, Naruto Uzumaki Chronicles 2 is reminiscent of games such as Final Fantasy and Kingdom Hearts where the player must embark on a variety of missions and engage in an over abundance of enemies as they kick, punch and "magically" defeat their foes. The title features a rather basic RPG aspect that is more suited to the younger gamer which allows you to upgrade your skills, giving access to a wide variety of skills and attacks. As you move around the "World Map", you will encounter a variety of NPC's who will either assist or hinder your path to glory but what makes the title sometimes frustratingly annoying are the random battles which seem to happen a little too often. 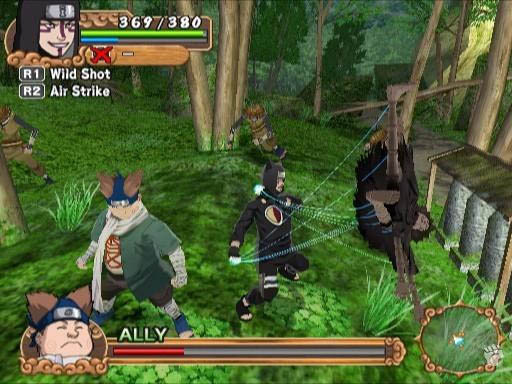 Fortunately, Naruto is joined by friends and allies which are all available to the gamer to play and can be swapped on the "fly" during the game. Swapping between characters is not only just for combat as certain characters are needed to access different puzzles and areas in the game which allows for a more in-depth and varied gameplay. Graphically, after playing the XBox 360, WII and PlayStation 3, it seems the PlayStation 2 is finally starting to show its age but fortunately the developers have pulled a few "graphical" rabbits from their hats with some interesting gaming environments that pay true homage to the anime heritage. The characters are all designed with a certain "out of this world" aspect that make them look comedic and sometimes out of place but that's is what anime is all about. Mix in a few special effects here and there and Naruto Uzumaki Chronicles is not bad a good looking game when mixed with the audio score (think Saturday morning anime) and wild and strange sound effects. In conclusion, Naruto Uzumaki Chronicles 2 is definitely one for fans of the previous title or for those Japanese RPG lovers who are after that traditional genre. Although not as entertaining as the first or offering anything new to the genre, Naruto Uzumaki Chronicles 2 follows a similar formula of the previous series which I'm sure fans will endeavor to enjoy.